Mesa County’s varied and unique terrain was formed by nature’s forces through millions of years. Here, the verdant Rocky Mountains meet the desert beauty of canyon country. The area’s first known humans arrived some 13,000 years ago. Native Americans occupied the area for thousands of years; Spanish Padres, mountain men and surveyors came to explore and record the region. Colorado became the Centennial State in 1876. Three years later, an Indian uprising near Meeker led to the removal of Ute Indians from the northern two-thirds of Western Colorado to reservations in Utah. White settlers arrived in Mesa County in 1881. In ancient times, oceans and then deserts covered Western Colorado. Their retreat left great deposits including sand, which compressed into sandstone. To the west of Grand Junction, the red sandstone has weathered into the canyons and elaborate formations of the Colorado National Monument. East of the Grand Valley is the vast, flat-topped Grand Mesa. Volcanic flows had covered that area, forming a protective layer of hard basalt, hundreds of feet deep. The surrounding terrain eroded away, leaving the Grand Mesa with its 10,000′ elevation, forests and lakes. 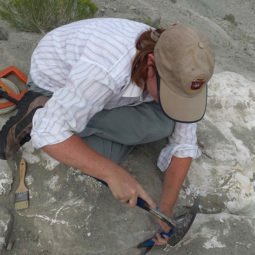 Mesa County has been the site of important fossil discoveries for over a century. These include some of the largest, and some of the smallest dinosaurs in the world. The earliest Brachiosaurus, and a largely intact Apatosaurus are among the many significant dinosaur discoveries. The Bollan Stegosaurus, including tail spikes, was excavated at Rabbit Valley by the Museum of Western Colorado. Mammal fossils of later periods also are found, including mammoth and bison remains. Traces of Paleo Indians in Mesa County date to 11,000 B.C., and Archaic Indians to 8,000 B.C. Fremont Indians were here about 700 to 1200 A.D. They lived in rock shelters and pit houses, which have yielded archaeological material. Rock art was etched or painted on cliffs and boulders. This example from the Fremont tradition is on a Mesa County ranch. The Fremonts eventually moved away, probably to the Rio Grande Valley and its pueblos. The Utes hunted over wide areas of Utah and Colorado. Some also had seasonal farms. Utes were noted for the fine ponies they raised and traded, and for their buckskin crafts. Ouray, born in 1833, became a tribal leader; his wife was Chipeta. The U.S. government accepted him as the chief Ute during treaty negotiations. In this 1880 photo, Ouray and Chipeta are on the front row. Indian trails were throughout Western Colorado. The Dominguez-Escalante party used those trails while exploring a route from Santa Fe to California. They came through Mesa County in August, 1776. A wagon road developed which is called the Old Spanish Trail. This sign, at Eagle Rim Park on Orchard Mesa, commemorates that trail and its ford across the Colorado River. In 1879, battles between the government and the Utes near Meeker, Colorado lead to old treaties being cancelled. The Utes were moved to reservations in Utah and Southwest Colorado, and our area was opened to settlement by non-Indians in September, 1881. Utes, however, were free to traverse the area during frequent treks between reservations. Pictured is a Ute who is visiting an early day Mesa County Fair. The 1880s was a decade of beginnings. Planners and visionaries in 1881 saw the promise in this broad valley. The arid Grand Valley was a desert, but it was traversed by two major rivers. Water from the Grand River ( later renamed the Colorado ) was soon brought to town and farms, via dams, canals and ditches. The first of many canals were the Pioneer Canal, and the Pacific Slope Ditch in 1882. Grand Junction was incorporated in 1882, and by 1883 Mesa County was established with Grand Junction as the county seat. The town’s population in 1885 was 378, according to a special Colorado State Census, but other sources claimed it was over 800. Benton and Evelyn Canon settled in Grand Junction in 1887. This bamboo pattern Belleek teapot, a fine porcelain from Ireland, was a wedding present that traveled with them. Kate Harlow and her husband, John Petal Harlow, had one of the first farms on Rapid Creek. They experimented with a wide range of grains, vegetables and fruit, and nearly everything grew well. Kate had an early restaurant and fruit stand on Grand Junction’s Main Street. On Sept. 26, 1881 the Grand Junction town site was selected, and stockholders then established the Grand Junction Town and Improvement Company. They owned the land, and were distinct from the town government. They surveyed streets and lots, promoted sales of the land they owned, and encouraged settlement. The town occupied a square mile, spanning from 1st to 12th Streets, and from North to South Avenues. The plat shows the layout of the town. The first structure in town in 1881 was the Town Company office. A log cabin at 2nd and Ute, it was built from cottonwood trees growing near the river. The residents were Mr. and Mrs. R. D. Mobley. R. D. Mobley was the first postmaster. Literary societies, churches, lodges, bands and orchestras, and plays and musicals soon flourished. The frontier town began to be polished. Schools were a major factor as music, art and drama were taught in addition to the three R’s. Here is a trio of teachers, ambassadors of culture, in fashionable attire. Schooling for the children was an early priority. Nannie Blaine Underhill was the first teacher. The first school, a crude cabin of upright logs, soon was replaced by a better building of local brick. Teacher Isa Caldwell is in the doorway. She began teaching in 1882 and taught all grades in the one room school. George A. Crawford (1827-1891) headed the Town Company and is considered “the father of Grand Junction.” A skilled entrepreneur, he also founded three cities in Kansas, and Delta, Colorado. Elected governor of Kansas in 1861 in an election invalidated on technicalities, he did not serve. However, he usually was known as “Governor” Crawford. Grand Mesa provided recreation from the earliest days. Scenic beauty, and abundant fishing and hunting were appreciated by the settlers. Summer homes and resorts began to be built, usually near cool lakes. Glade Park also was a summer favorite. Winter sports were sledding and skating. Skiing came later. The Denver and Rio Grande Railroad reached town in November, 1882 and it was a major boost to the success of Grand Junction. Trains were of paramount importance in the era before automobiles, trucks and airplanes. Grand Junction became a major division point of the railroad, with repair and maintenance shops. By the 1890s the main elements of the economy were in place. Agriculture, commerce and transportation continue to this day. Grand Junction’s population in 1890 was 2,030, according to the Federal Census Bureau. Many varieties of fruit soon became prime crops. The Grand Valley has a long growing season, warm days and cool nights, and irrigation which allows water to be applied exactly as needed. These factors all contribute to growing fruit of extraordinary quality. This scale was owned by John Hines, an orchard owner who was one of the area’s first black residents. Selling our fruit to distant markets became a large business. The Colorado Fruit and Commercial Company and the Grand Junction Fruit Growers Association were two of the largest firms. The Fruit Growers Association, shown here, also evaporated fruit, which is superior to drying. For example, in 1904 they processed 244,466 pounds of Italian prunes in their evaporator building. This yielded 92,207 pounds of concentrated fruit, without moisture. Frank Dean was a photographer in the booming silver mining towns of Western Colorado, and also in Grand Junction. By 1900 he moved here permanently and began a forty year career of photographing people, events, buildings and landscapes. His excellent photos are a valuable recording of the area’s history. Churches were organized in early Grand Junction and the first small buildings soon were outgrown. Typical was the 1890 Congregational Church. By 1904 the burgeoning congregation rebuilt at the corner of 6th and Rood. They installed the first pipe organ in town, a Kimball Hydraulic Pneumatic Duplex concert instrument. In addition to worship, some churches also were used for musical and literary performances. Originally named the Park School, the Emerson Grade School was built at 9th and Ute in 1903. The architect’s drawings of the large building included a dome, but it was not included. Ninety-nine years later the building had essentially the same appearance, minus the belfry and spire. James Bucklin was a lawyer, a founder of Grand Junction, and a stockholder in the Town Company. New ideas in politics and government intrigued Bucklin and he promoted the unusual Preferential Voting System, in use here from 1909 to 1922. Citizens voted for everyone running for an office, in the order of the voter’s preference. Winners were those who tallied the largest number of high preference points. This innovation gained Grand Junction national and international attention. First held in 1887, the Mesa County fairs were initially held at 7th and Patterson, then at Lincoln Park. 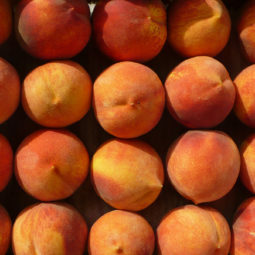 Over the next two decades some of these annual celebrations were tailored into “Peach Day” festivals, focusing on one of the county’s most delectable and sought-after products. President William H. Taft visited the fair on his way to Montrose in 1909 to dedicate the Gunnison Irrigation Tunnel. An electrically powered streetcar system was inaugurated May 27, 1909 by the Grand Junction and Grand River Valley Railway. When few people owned automobiles, streetcars were a great convenience for many riders. Streetcars were smooth, quiet, non-polluting transportation. Earlier, the city had horse-drawn streetcars from 1890 to 1903. Grand Junction by 1900 had evolved from a simple frontier town to a small city with advantages normally only found in much larger communities. This set the pattern that continues. The 1900 Federal Census recorded a Grand Junction population of 3,503, a 72.6 percent gain over the previous decade. By 1902 the town hired its first crew of three professional firemen, with horses to pull a fire engine. Volunteer firemen were still available, however, and this cap was worn by a member of Hose Company #1. The oil lantern was necessary before electric lights became common. The “fruit gathering bag” was patented in December 1900 by George W. Bowman who lived in Palisade. His wife, Nancy Cutter Bowman, is credited for the idea because she would use her apron to hold fruit while picking so it didn’t bruise. The decade of the1910s saw growth and prosperity, but it was overshadowed by World War I which began in Europe in 1914. When the war ended in 1918, Grand Junction shared the national optimistic spirit that believed we had fought the final war, and civilization had moved beyond armed conflict. People believed the massive conflict was the “War To End All Wars.” This hopeful outlook was doomed to disillusionment. The population of Grand Junction in 1910 was 7,754, a 121.4 percent increase in a decade. World War I artifacts at the Museum include this bugle. They had many uses as a signaling instrument before radio was common. The khaki colored cap was standard issue for a soldier’s uniform. One of the largest irrigation projects in the nation, the Highline Project was completed in 1918. It provided the water to cultivate 50,000 acres in the Grand Valley. The unusual roller dam is shown as it was being built across the Colorado River in DeBeque Canyon. The level of the reservoir behind it is controlled by raising or lowering large steel cylinders, called rollers. There are only three roller dams in the country, and this is the largest. In 1911, the elegant Grace Miller posed in fashionable clothes. She and a partner operated The Ladies Tailoring College. Grace secured her hat with a long hat pin, and a second pin was held ready between her teeth. A breeze could send a large hat flying away, and pins through the hairdo and hat kept the hat in place. The Park Opera House was at 430 Ute Avenue, facing Cottonwood Park – later Whitman Park. (The site is now the Museum of Western Colorado parking lot.) Equipped for theatrical events, lectures and music of all types, it featured local and touring companies. Performers from the Barrymores to the Four Cohans appeared there. The Opera House was in use from the 1890s until the 1920s when moving pictures changed theatrical demands. A larger high school building was needed, and the 900 block between Chipeta and Gunnison Avenues was bought for the new location. The central section was built in 1911, and wings on each side were added beginning in 1917. There were 36 rooms and an auditorium for 500. The small number of students in 1891 had grown to over 600. Richard E. Tope was a school administrator. “Professor Tope” was admired as a cultivated gentleman of wide learning who recruited an outstanding staff of teachers, and set a standard of excellence. Mr. Tope was principal of the high school 1911-1918, and then superintendent of schools until 1938. On retirement he was appointed superintendent emeritus and consultant. Spectacular red sandstone cliffs and canyons are to the west of Grand Junction. John Otto, pictured on horseback, was an environmentalist and visionary. He was determined that this scenic domain should be saved intact as a natural park. This dream was realized in 1911 when the Colorado National Monument was established. Otto, the first park superintendent, developed many hiking and horse trails including the twisting Serpent’s Trail Road, now used for hiking. Influenza epidemic kills millions worldwide, and in U.S. The 1920s were called “The Roaring Twenties” nationally. But in Grand Junction these years were calm and progressive. There was much construction, including a fine new courthouse, the Avalon Theatre, and many schools. The council and city manager form of administration dates from 1922. The population reached 8,665 by 1920, for an increase of 11.7 percent between 1910-1920. An accessory from the 1920s is this woman’s purse in royal blue beadwork. The frame and clasp are filigree metal. The small size of the purse is appropriate for downsized clothes. Women’s fashions became less confining in the mid 1920s as hemlines rose to the knees, and sleeves could be short. Women’s figures were expected to conform to the new slim look. The vast orchards in the Grand Valley needed chemical sprays to control insects. General agriculture also used sprays for weeds and insects. The Latimer-Goodwin Chemical Company manufactured and distributed sprays and fertilizers, and had a branch in the fruit growing areas of the state of Washington. They also made cider from apples, and fermented vinegar. Olney E. “Ollie” Bannister was a patriarch of the family who operated Bannister Furniture Company from 1897 to 1999. Bannister also was active in politics, and was in the Colorado State Senate from 1918 to 1934. Among the causes he championed was the legislation which established Mesa College in 1925. When Franklin High School was razed at 6th and Rood, the site was used for the new Mesa County Courthouse. Construction began in 1922 on the limestone, neoclassical structure and it was built to high standards. Hallways had marble wainscoting and terrazzo floors, court rooms were outfitted in golden oak. The front doors of brass had ornate grilles. It was dedicated in 1924. Suffragettes were the feminists of their time. They campaigned for the right of women to vote, and the 19th Amendment of the Constitution gave them the vote nationally, beginning with the 1920 election. Women had voted in Colorado since 1893 because state law assured them that right, but local women were elated that the privilege now was policy in all the states. As early as 1904 there was an attempt to establish a state college here. The idea of two year junior colleges was developing in the 1920s. Eventually the Colorado legislature and the governor agreed to an extension school of the University of Colorado. In the fall of 1925 the first college classes convened in the recently vacated Lowell School building at 5th and Rood. The nearby YMCA provided a gymnasium. Forty-one freshmen enrolled in Grand Junction State Junior College, forerunner of today’s Mesa State College. William J. Moyer, shown near a Christmas display in the Fair Store, became the leading citizen of Grand Junction. The Fair Store opened in 1890 and was the largest department store in Western Colorado. His other major investments included the Grand Valley National Bank. Mr. and Mrs. Moyer were generous with their wealth. They financed young people through college and donated the city’s first public swimming pool, the Moyer Natatorium. Unfortunately, the Great Depression of the 1930s brought financial ruin to the Moyer enterprises. Plays and operettas were staged by Grand Junction High School students, and were attended by enthusiastic students and the public. The Senior Class play of 1925 was “The Rejuvenation of Aunt Mary.” Another play and two operettas were performed that year, usually at the Avalon Theatre to accommodate the crowds. The first automobile show in Grand Junction was in May, 1926. It was in the Lincoln Park Auditorium (later mistakenly called the barn ). Some familiar cars are shown. The Ford, Lincoln, Chevrolet, Dodge, and Buick brands are still with us. Hudson, Nash, Studebaker, and Willys were large manufacturers of the time, but exist no more. Grand Junction Junior High (which was later Columbine Elementary) and High School Gym completed (9th and Chipeta). Both of those buildings have been demolished and the new Chipeta Elementary stands on that site. The Great Depression dominated the country in the 1930s. Grand Junction’s regional economy eased the harshest effects. This was not a manufacturing center, with closed factories and large numbers of unemployed. Growth was slow, but the 1930 population was 10,247, an 18.3 percent growth from 1920. Despite the economic depression of the 1930s, peach production remained fairly profitable. Palisade was the major peach orchard zone, but the Redlands and Bridgeport also had extensive production. Fruit picking sacks, with a bottom which opened easily for emptying, were widely used. They were patented in December 1900 by George W. Bowman who lived in Palisade. His wife, Nancy Cutter Bowman, is credited for the idea because she would use her apron to hold fruit while picking so it didn’t bruise. The Mountain Lion Fruit label adorned millions of boxes. Wooden baskets also were used widely. There were many pear orchards as well, chiefly around Clifton. World War II brought shortages of many commodities, and the government issued ration books to citizens. Coupons entitled customers to buy allotted amounts of goods like canned food, meat, butter, shoes and gasoline. Coca-Cola was not rationed. It was available in its curvaceous glass bottles, not in cans. Military uniforms were well tailored of durable fabrics, and included headgear. World War II put the entire national economy into high gear, and agricultural production and prices were boosted out of the Depression doldrums. Mesa County fruit, livestock and field crop production flourished. Canning factories, like the large Kuner-Empson facility, operated at full capacity. It was located on South Eighth Street near the railroad. The La Court Hotel at 2nd and Main Streets was operated by the Buthorn family for two generations. The lobbies were handsome, the dining room was noted for its cuisine, and the Green Room hosted service clubs and banquets. During the 1940s and 1950s their steak house, known as The Tavern, was a main center for uranium developers and investors to meet and strike deals. The attack on America at Pearl Harbor, December 7, 1941, plunged the nation into World War II. Mesa County’s James Massey and Harold Wood were among the fatalities on that first day. Many hundreds of our Grand Junction men and women were soon in all the military branches, serving around the world. The very successful Columbia Concert Series began in 1944, and still continues at the Mesa County Community Concert Association. Many outstanding musicians, and occasionally theater and dance troops, appear during the annual season. Mrs. Melba Schmidt was a founder, and the president for 15 years. With her is Dimitri Mitropolulos, celebrated conductor of the Minneapolis Symphony who performed here in 1947. Mesa College was ready for relocation, and 1940 saw the opening of the first building on a new campus at 12th and North. The building incorporated classrooms, auditorium/ gymnasium, administration and library. It now is named Houston Hall for Clifford Houston who was third head of the college, from 1932-1937. It has been remodeled, but the appearance is much the same. Army Captain Phillip Couzens Leahy headed a project which had international impact. Few people knew of this at the time, because it was part of the government’s secret Manhattan Project which developed the atomic bomb. From March, 1943 to March, 1946 he directed the discovery, refining and procurement of uranium from the Colorado Plateau for atomic research. He became the first manager of the Atomic Energy Commission Compound from 1947 to 1949. On the west side of Grand Mesa, the Lands End Road is a challenging climb. A long steep grade, it has multiple curves and sharp turns. It was the site of car races on the Fourth of July, 1940 and 1941, and then again in later years. Louis Unser, winner of many Pikes Peak Hill Climbs, declared Lands End was the most difficult course in the nation. Among the 16 racers in 1941, there were two French drivers who imported their Talbot cars. Bob Baughman was one of the local contestants, shown with the racer he built. On April 1, 1946 Western Airlines established regular flights to Grand Junction on the Denver and Los Angeles routes. This was the beginning of major airline service here. Monarch Airline, which became Frontier, began multiple daily flights on January 17, 1947. On September 15, l947 United Airlines assumed the Western routes. Starlight, first drive-in movie theater, opens at 24th St. and North Ave.
Clifton, Fruitvale and Pear Park join together to become Central School District #48. During the 1950s, the turbulence of the Great Depression, World War II and Korean War were succeeded by a nation focused on the pursuits of peacetime. Grand Junction also thrived, and the uranium industry was an added stimulus. Population in 1950 was 14,504, a 16.2 percent growth through the 1940s. “Aspinall for Congress” automobile tags were common in Grand Junction during elections. Wayne Aspinall could always count on solid support in Mesa County. Geiger counters measure the radioactivity of uranium. Many Geiger counters were manufactured in Grand Junction during the uranium boom. Brownie cameras were inexpensive, simple to operate, and a favorite. Fruit from the Grand Valley continued its reputation for top quality. The peach orchards produced record crops at good prices. There were 900,000 trees and more than 800 orchards. However, pear and apple orchards continued to be replaced by general farming, and subdivisions continued to encroach on prime agricultural lands. Wholesale firms in Grand Junction supplied businesses in Western Colorado and Eastern Utah. In Colorado, the wholesale businesses in Grand Junction were second only to Denver. The wholesalers flourished, especially in the booming 1950s. Biggs-Kurtz Hardware dealt in all lines of light and heavy hardware. The Independent Lumber Company had 19 lumber yards regionally, and was both wholesale and retail. The C. D. Smith Drug Co. had both drug and chemical divisions. Other wholesalers provided groceries, paper, dairy products and petroleum, to name a few. Uranium mining and milling became a large industry on the Colorado Plateau. The Grand Junction Operations Office of the United States Atomic Energy Commission was headquarters for the enterprise, and bought all the uranium produced. Grand Junction also was home base for as many as 35 mining companies, including area offices of major mining corporations. Artist groups had long planned for an arts center. The Western Colorado Center for the Arts dates from 1953 when the Mesa County Arts Center Board was incorporated. They bought a building near 7th and Orchard (pictured), and opened it in 1960. A hexagonal building was added in 1970, and there have been further additions. By the 1990s art instruction and exhibits in the galleries were provided year around, and the auditorium hosted music, drama and dance. The expanding student population of Grand Junction prompted the building of a new high school in 1955 on North 5th Street. It was designed in a clean lined, modern 1950s style by architect Paul Atchison of Denver. The auditorium was made large enough to serve also as a civic auditorium. Wayne Aspinall was the U.S. Congressman from this District from 1949 to 1973, becoming chairman of the powerful House Interior and Insular Affairs Committee in 1959. Serving until 1973, he was chairman in this important post longer than any other congressman. Dams, reclamation, mining and forestry are crucial to the West, and he was vigilant in promoting those interests. A masterful legislator, he managed over 1,000 bills in the House, and every one passed. The National Junior College Baseball Tourney, nicknamed JUCO, moved here in 1958. It has wide local support. The top ten junior college teams from across the nation come here to compete to be number one. In the spring, JUCO guarantees a rousing series of games which fill the stadium with avid sports fans. This is at Suplizio Field in Lincoln Park. Railroads were vying with aggressive airlines for passenger business. Interstate highways also made long distance driving more convenient. Streamlined luxury trains were the railroads’ answer. The Denver and Rio Grande had the sleek California Zephyr with Vista Dome cars, gleaming in stainless steel. It ran from Chicago to San Francisco via Grand Junction. The 1960s saw significant new developments. The Interstate Highway system reached here, and put Grand Junction on that important national transportation grid. The innovative downtown shopping park drew national attention. The city’s population in 1960 had reached 18,694, a 28.9 percent increase over 1950. The All America City recognition inspired widespread use of its logo. Even ash trays were adorned with the city’s new honor. The metallic red shoes with spike heels and pointed toes were dress-up shoes for teacher Gladys Conway. A hat, gloves and purse also were included in a woman’s ensemble. Cattle, sheep and horses were characteristic of ranches surrounding Grand Junction. In the West, riding and roping skills led to rodeo competitions. They evolved into dramatic professional rodeos, such as the Colorado Stampede Rodeo, sponsored annually by the Mesa County Sheriff’s Posse at the Fairgrounds on Orchard Mesa. New technological developments in electronics spurred its manufacturing. Electronic manufacturing plants began to open in Grand Junction to take advantage of the available labor force. Dixson, Ultronix, and Hickok were some of the manufacturers. Lower labor and distribution costs elsewhere lead most of them to move away in later decades. Main Street in Grand Junction was becoming congested with traffic, and streets and walks were aging. In the spring of 1962 Operation Foresight began reconstruction of the infrastructure, and also expanded the parking available. In May 1963 the project was completed, including extensive landscaping. The city was awarded All America City recognition by Look magazine for the innovative and successful downtown shopping park. Mildred Hart Shaw ( here atop an elephant ) was a reporter, an editorial writer, and then book reviewer on the Daily Sentinel from 1936 to 1980. From 1959 to 1970 she also mentored the Junior Great Books reading and discussion groups for high school students. Many were intellectually stimulated by these sessions, and went on to excel at colleges and universities. Mesa College dedicated the Walter Walker Fine Arts Center on November 21, 1969. The auditorium presented the Performing Arts of music and drama. Instruction for those fields was provided in adjacent studios and classrooms. A nearby building had workshops, studios and kilns for the Fine Arts of painting, drawing, sculpture, metal and ceramics. Dale Hollingsworth was manager of the Grand Junction Chamber of Commerce from 1957 to 1968, and 1970 to 1984. As head of the Chamber, Hollingsworth was a leader in promoting the city and the area. Operation Foresight rejuvenated downtown, and the Chamber of Commerce was an important facilitator. Skiing on the Grand Mesa had a major shift when the Powderhorn Ski Corporation bought the assets of the modest Grand Mesa Ski Club. In 1966 they cleared new runs, built the first of four chair lifts, and a lodge. Other expansions have followed. Powderhorn is now a large modern ski resort with a ski school, Nordic and Alpine terrain, ice skating rink and condominiums. The national Interstate Highway system was initiated in the 1950s. Interstate 70 reached Grand Junction in the 1960s. The highway through Glenwood Canyon was the final link in the national system and was not finished until the 1990s. Dixson, Inc., relocates from Vashon, WA; merges locally with General Meter, Inc.
During the 1970s, citizens were able to afford hot air balloons, sail planes and fine horses. More prosperity was expected as regional corporations invested in huge shale oil projects. In 1970, the beginning of that decade saw a population of 20,170, a 7.9 percent increase in ten years. Oil shale artifacts include a cylindrical core sample of gray shale with petroleum traces. The cast aluminum retort is for weight testing shale oil. The desk set has a slab of oil rich “mahogany ledge”, and fossil leaves. This is from the desk of Grand Junction attorney Owen Aspinall, who was governor of American Samoa 1961-69. Horses for farming and transportation mainly were replaced by cars and trucks in the early 1900s. In the Grand Valley, horses began to be used more widely for recreation. Well bred, highly trained steeds began to be raised on the acres of profitable horse farms. Hunting, trail rides, dressage, and the Sheriff’s Posse were enjoyed by riders and their mounts. To meet new business circumstances, the Downtown Development Authority was initiated by Grand Junction business owners in 1977. West of town, a mall began in the late 1970s and it has grown into a regional shopping center. Typically, malls deplete old downtown areas. The DDA has kept the Main Street Shopping District viable and thriving. Benge’s Shoe Store has been on Main Street since 1911, and is a DDA member. Banks, and savings and loans needed to expand to new and larger quarters. Valley Federal Savings and Loan chose to erect a tall building with offices for lease on the upper floors. Opening day was November 25, 1974. The building at 5th and Rood is now the Alpine Bank. Mesa Federal Savings & Loan, and Modern Savings and Loan also had handsome new buildings. The Grand Junction Musical Arts Association was formed to promote orchestras, opera and dance. The Mesa College Orchestra came under its wing and was reorganized as the Grand Junction Symphony. The first season was 1978-1979. A full season of classic concerts is offered, as well as pops and children’s concerts. The Nutcracker Ballet is a December symphony tradition. Girl Scout and Boy Scout troops teach young people many skills which have lifelong value. Personal character, knowledge, the lore of nature, crafts and recreation are aspects of the multi faceted program. Scouting is a valuable addition to formal education. Summer and winter camps on Grand Mesa are settings for learning and recreation. Jane Quimby was a busy citizen with a large family, who still made time for community involvement. She served on the City Council from 1973-1981 and was mayor 1979-1980, the first woman in that post. Jane Quimby also was a founder of the Grand Junction/Mesa County Riverfront Commission, and of the Western Colorado Community Foundation. Gliders, also called sail planes, have no engines and rely on air currents to power them. They soar as quietly and gracefully as birds, their use becoming popular here in the 1970s and 1980s. Desert hills of the Grand Valley generate strong updraft thermals for soaring. Bill Hill set an international record by flying a 300 km triangular course at an average 120 k.p.h. Hot air balloons carried a few animals and people aloft in the late 1700s. They evolved into massive, passenger carrying Zeppelins which crossed oceans in the 1900s, but faster airplanes prevailed over them. Colorful hot air balloons have made a comeback, with balloon and passengers propelled by breezes. The first balloon rally here was November 25, 1978. 80 people are injured and 25 are hospitalized at St. Mary’s as a circus tent blows down with 800 spectators inside. Prospects looked dynamic in 1980, but the collapse of the oil shale industry in 1982 lead to a drastic retrenchment. Nonetheless, Grand Junction celebrated its centennial with high spirits in 1982. The population had grown to 28,144 in 1980, a 39.5 percent jump from 1970. The centennial of Grand Junction was a community wide celebration in June, 1982. There were parades, fireworks, concerts, picnics and a pageant in Lincoln Park with costumed citizen performers. This frisbee was one of the products to celebrate the centennial. Also shown are shirts from bicycle and foot races of the decade. The agricultural conditions which ensure prime fruit in the Grand Valley, also produce premium grapes. In the 1980s, serious planting of vineyards for wine grapes began around Palisade, and wineries were established. Prize vintages are being developed, and the wineries also are a tourist attraction. Viticulture now is branching out to other areas of the Grand Valley. (Photo taken at Grande River Vinyards, Palisade, Colorado, 1999, photo by Jack Dykinga. Mountains with layers of shale stone stretch from Colorado into Utah, and cross northern Mesa County. The shale has vast petroleum deposits imbedded, and in the late 1970s and early 1980s, billion dollar facilities were being built in adjacent Garfield County for shale oil extraction. Grand Junction boomed as a regional oil headquarters. A sudden drop in oil prices halted this, starting May 2, l982. Boom turned to bust, and the economy of this city and the whole area suffered. Art on the Corner is an outdoor display of sculpture which originated in 1984. New selections are installed in the Downtown Shopping Park for a year, and a number of them have been bought for the permanent collection. The first purchase was Chrome on the Range II, a shiny metal buffalo which is a popular favorite, by sculptor Lou Wille. In the late 1940s, the Avalon Theatre had its facade remade in a simple, modern mode during a radical interior and exterior remodeling. It was renamed the Cooper. The facade has been rebuilt in its original style. This 1996 photo shows the restored Avalon with its new/old face. Other downtown buildings also are being restored to their historic appearance. Not every student is geared toward standard schools and the school district formed the alternative R-5 High School. The curriculum offers more vocational courses and flexible hours, and has been very successful. It is in the former Lowell School, built in 1925. Student input lead to the name R-5, which stands for Readiness, Relevancy, Reinforcement, Responsibility and Respect. Ted and Maxine Albers were King and Queen of the Grand Junction Centennial celebrations in June 1982. Both made an impact in many civic areas. Ted was president of Mesa College 1970-1974. Maxine was the first woman Mesa County Commissioner 1974-1989, serving five terms as chairman of the Board of County Commissioners. Our Colorado Riverfront was an overlooked asset. The Grand Junction/Mesa County Riverfront Commission was formed in 1987. Pat Gormley (l) and Governor Roy Romer (r) are shown explaining the plans. Local funds, state lottery and State Parks Board grants, and volunteer labor have cleaned and transformed the river landscape. 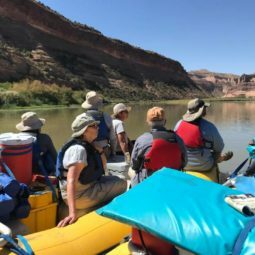 Parkland and trails, lakes and wildlife habitat, the Botanical Society and its gardens now grace the shores and islands of the Colorado River. A new Walker Field air terminal and parking areas were opened December 15, l982. The terminal is in contemporary architecture, with solar heating features. Auxiliary businesses at the airport also have expanded with extensive airplane sales, maintenance, rebuilding, air charter, flight training and car rental. These enterprises employ hundreds. During the 1990s, Grand Junction continued a steady recovery after the oil shale shock. A variety of new industries, tourism and retirees all contributed to an eventual comeback. The population through the 1980s had crept up to 29,034, which was only a 3.2 percent growth. The Grand Junction Police Department issues annual reports on its multiple activities. The small force of a hundred years ago has grown to over 200 officers and support staff. Insignias shown here signify different ranks. The baton and badges are from Lt. Bob Knight. The arid Grand Valley depends on irrigation. In the late 1800s the newly watered desert developed high water table and alkali problems. Drainage ditches were the solution. A century later, alkaline salts which leached from the soil and entered the Colorado River were another problem to be addressed. Lining ditches with concrete to control seepage began in earnest in the 1990s. A local business with customers near and far is Reynolds Polymer Technology, Inc., which moved to Grand Junction in 1993. Reynold’s huge sheets of clear, strong polymer are supplied to major aquariums worldwide, including Denver, Chicago, and London. Reynolds is an example of the many businesses which are part of Grand Junction’s rebounding economy. St. Mary’s Hospital and Medical Center was founded in 1896. It has grown to be a major Colorado hospital which serves a wide area of Western Colorado and Eastern Utah. Air transport ambulances are on call. There is comprehensive medical care, all the way to complex surgeries. Other modern facilities here are the Veterans’ Administration and the Community hospitals. The ethnic heritage of citizens began to be more widely appreciated. The downtown shopping park is the setting for the Latino Cinco de Mayo celebration, and the German Oktoberfest. Music, arts, crafts, dancing and ethnic foods are there in abundance for the crowds. Italians, Blacks, Basques, Scandinavians, and the many Celtic groups also have organizations and festivals. The Tilman Bishop Unified Technical Education Campus (UTEC), dedicated in 1992, was enlarged in 1996. The school, affiliated with Mesa State College and the Mesa County School District, offers vocational education in many fields. Computers, auto mechanics, hotel and restaurant management are some of the majors. Culinary students even operate a quality restaurant, open to the public at noon. Dr. Geno Saccomanno arrived in 1947 to start the pathology departments at St. Mary’s Hospital, and at the V.A. Medical Center. The Saccomanno techniques and the equipment he developed, which detected links between uranium radiation and lung cancer, were innovative and profound. They brought Dr. Saccomanno international acclaim and honors. In the 1990s especially, he and his family were generous as philanthropists. Golfing was at the Lincoln Park and Bookcliff Country Club courses. Growing population and wider enthusiasm called for more ranges. On the Redlands the Elks Club developed Tiara Rado, shown here, which the city bought in 1995. Fine new courses since then include Adobe Creek near Fruita, Chipeta on Orchard Mesa, and now the nationally acclaimed Redlands Mesa course. The Denver & Rio Grande Western Railroad was a mainstay for our passenger and freight traffic, from 1882. Its long corporate life as a regional carrier was altered, as railroads nationwide were incorporated into conglomerates. The D.& R.G., and the Southern Pacific, were merged into the Union Pacific. Burlington Northern Santa Fe also has service through here. The 2,000 Millennium saw an array of fine new public buildings in Grand Junction, with more being planned. The rapidly growing city needed these amenities. The number of inhabitants was 41,986 in 2000. This was a 44.6% increase over 1990. Grand Junction, its suburbs and nearby communities added up to a population of over 100,000. The Census Bureau classifies this as a Metropolitan Area. The Enstrom’s Almond Toffee has been operated by three generations of the family. Their almond toffee is the biggest seller, with customers in every state and around the world. Shown are some promotional items, with their logo. 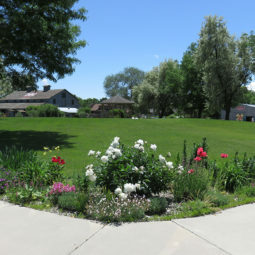 Gardeners benefit from the Master Gardener program of the Colorado State University Cooperative Extension on Orchard Mesa. This center, and two others in the valley, are of great value to area agriculture. Master Gardeners learn improved ways to cultivate their yards and trees, fruit and vegetables for maximum yield and quality. They also mentor new apprentices. The national economy surged ahead in the 1990s, and Colorado was among the leading states in growth. A survey in 2,000 saw that of the twenty American cities with the strongest economies, Colorado had six. Grand Junction was #12 nationwide of these stellar performers. The city developed a wide economic base, and the oil shale collapse of 1982 was far behind. Mesa County courts built a new Justice Center which was inaugurated in 2001. It is at West Main and Spruce Streets, and is connected to the City/County Jail and Sheriff’s Department by a secure tunnel. Transportation of detainees to court hearings by armed vans had been complicated. Detention and courts now are conveniently close. The Museum of Western Colorado, founded in 1965, opened a new History Museum and main office in May, 2000. The building is the former headquarters of the C.D. Smith Company. A solidly built brick structure dating from 1936, it was remodeled with exhibit galleries and the Loyd Files Research Library. The Sterling T. Smith Tower offers vistas over the city and valley. The Museum also includes Cross Orchards Historic Farm, Dinosaur Journey (Fruita) and the Whitman Education Center. Mesa State College now has more than 5,000 students. A wide range of majors are available, and several master degree programs are offered. Shown is a student at a computer terminal in Tomlinson Library. The cultural life of the city is enhanced by art shows and performing arts performances. A wide variety of sports are another contribution to community life. Herbert Bacon and the Bacon Family Foundation are benefactors of many worthy community causes. Banker E. L. Bacon and his family moved to Grand Junction in 1948. Sons Herbert and the late LeRoy were chairmen of two banks, and major figures in furthering the development of a vibrant city and region. Canyon View Park is a 110 acre recreation park at the corner of 24 and G Roads. Sports fields accommodate basketball, softball, soccer, volley ball, disc golf, skating, and also picnicking and playgrounds. The city parks department maintains 35 parks, and several trails including the river front; 381.5 acres are available for five new city parks. Public transportation had lapsed in Grand Junction. A new bus system, which also reaches to nearby communities, was inaugurated in February, 2000. The routes are designed to provide access to shopping, medical care, recreation and to intercity transportation. Suburban areas also are serviced in this comprehensive system, with plans for future expansion. City begins work on railroad underpass at 30 Road and North Ave.